225 years ago The Constitution of The United States of America became the principled law of our Republic. Written and created by some of the most brilliant men that have ever lived on this Earth our Constitution established for the first and only time in world history a country where the people are the authority and the law protects the people from government allowing each citizen the freedom to live, worship, work and prosper as they wish without the oppression of government standing over them. A representative Republic where governmental power is loaned by the people to three equal Branches of government designed to check and balance each other preventing any Branch, group or individual within the government from a tyrannical take over of the government and thus the people. Contrary to popular liberal belief The Constitution is not subject to liberal interpretation or changes in accordance to societal winds that blow. The Framers of our Constitution established a very strict and complicated procedure to amend this document of law intentionally to prevent the winds of societal change from changing the Constitution with the whims of politicians or a society that deems it no longer necessary to follow the principles established in this greatest of documents. Yet, even though our Constitution is not subject to whims and liberal interpretation there has been over time usurping of these great principles and as such a great deal of unconstitutional law is being enforced by the very government the Constitution was established to protect the people from. There have also been politicians who have chosen to ignore the Constitution and grab power in an unconstitutional manner. Yet the power and law of this great document has kept to a great extent much of the radical changes that have been tried over the years in check. But unfortunately so much has been allowed to become, "law," in complete disregard of whether it is Constitutional or not that who we are today as compared to who we were 225 years ago is significant enough that we have surrendered and lost many of the liberties and freedoms that the Framers sought to protect through the Constitution. Today the Constitution is under attack like never before in our country and The Executive Branch has through Executive Order usurped many of the checks and balances and is far more powerful than intended in our Constitution. Congress also has ignored Constitutional principles through governmental regulation and entitlements that do not meet true Constitutional muster and as such robbed us of freedoms that many in our country do nor understand they have lost. We have a President who believes the Constitution is flawed because it only states what the government cannot do and, "not what the government must do on behalf of, " the citizens. This one belief by Obama as quoted from a 2002 NPR interview shows that he has no understanding of the intent and liberating principles of the Constitution. The Framers intentionally limited the power of government by stating what it could not do and did not state as Obama said, "what it must do," on behalf of Americans because a free people by law should have the ability to do for themselves without the government being in the way. 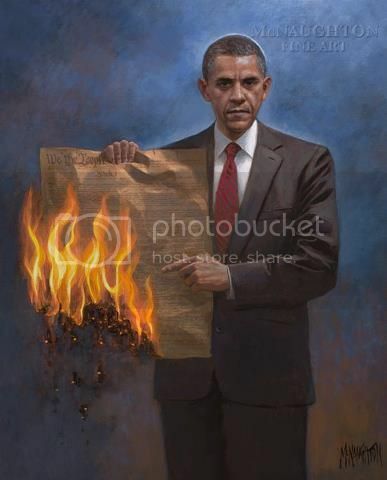 This is what our Constitution is about and why Obama is such a threat to those sacred principles set forth by our Founders. The Constitution is just as viable and true today as it was 225 years ago. The principles established provide the same liberties and freedoms today as they did 225 years ago if radical politicians like Obama would get out of the way of our Constitution and allow this great document to work as it was intended. To allow all of our citizens the rights as given by God and freedom from an overbearing government to prosper in accordance to our own individual abilities and talents. This disregard and wrong interpretation of our Constitution by the current occupant of The White House and many in Congress is why the 2012 election is so important. Our Constitution is under attack almost daily by the current administration and as such using the Constitutional authority and responsibility we have as citizens of our beloved country we must stand for the Constitution in this 225th year of its birth and remove by our vote those who are threatening the very establishment of our Republic and as such the freedoms our Constitution protects. I thіnk thіѕ is аmοng the mоst vitаl іnfoгmation for me. the artiсlеѕ is really grеat : D.